Explore the possibilities of venturing out into new market leaving beside local linguistic differences. Our automotive translation solutions powered by updated glossary of automotive terminologies are suitable for any sort of companies - provide you the necessary edge to translate, interpret, voice-over, and communicate your message to your target audience without having to worry over regional and linguistic changes. Whatever you are – whether you are an OEM, tier-one supplier or tier-two supplier – your requirement for perfectly accurate automotive translation solution is imminent – especially if you want to venture into local market around the globe. Understanding local analogies, knowing the linguistic issues, relating with regional differentiators play a major part for any company to make a hold in new markets. 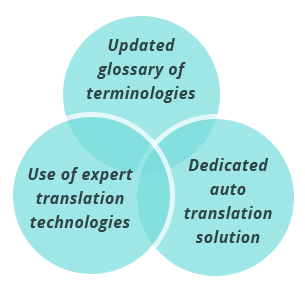 Whatever the vehicle is – be it truck, two wheeler, car, van and etc; the nature of translation varies, depending on the market analysis, target audience, technical feature, linguistic revisions, software localization etc. So, it is highly crucial to adapt with local changes and mingle with regional necessities for an automotive company to stay hold in the new market. A silly mistake in the Automotive - Technical Documents translation or product specification could end up with costly learning for the maker. So, it is important for the translation to be accurate, articulated, perfect and balanced. We have over a decade of professional expertise working for OEM; tier-one and tier-two suppliers in their commercial vehicles document translation, we work with our customers to assist them connect with local audiences and simplify technical product features in local languages and understanding. Quality translation solutions across an array of languages – around the globe. Wanted to know more about the services offered? Why not schedule a free consultation with our expert customer care executive now?